Endorsements : Madame Fifi Publications, Innovative teaching materials to get students speaking in world language, ESL, language arts, and other classrooms, song methods, creative ideas, workshops, Virtual Residence Language method. "I already have your ‘Over 1,000 Conversation Starters’ and have used it nearly every day since I bought it.” - Amy A.
FRENCH & SPANISH. 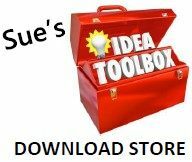 Click IDEA TOOLBOX.